Your one source for all job hunting assistance. In today’s tight job market, you need an edge over your competition. A well written, professionally printed résumé is the first step in securing that all-important interview. Unfortunately, many qualified candidates are often overlooked because their résumés are poorly written. Most human resources managers and recruiters receive thousands of résumés. They might spend a minute or less scanning each one, putting only a few selected résumés aside for more consideration. A professionally prepared résumé gives you an immediate competitive edge. Printed Pages can help you every step of the way—from consultation and writing to design and printing of the final product—we are committed to making your résumé show prospective employers that you have the talents and skills they need. Printed Pages offers a free, no-obligation evaluation of your current résumé. Certified Professional Résumé Writer on staff. 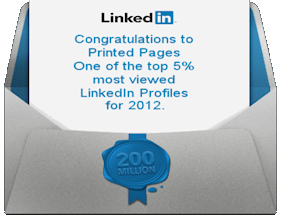 Printed Pages is a member of the Professional Association of Résumé Writers. "I want to let you know that a recruiter I talked to asked me what program I used to create my résumé. I told him I hired someone and he said I don't know what you paid her but she was worth every penny!" "...Thank you so much for your help on my résumé. I think it has been a real door opener... The new job base pay is $20K more then what I was getting at (company name deleted) ... I was able to get several interviews and I received complements each time on the resume. I know that my interview and skills got me the job but the résumé helped open the doors! Thank you again, and I will be reaching out in a few months begin working on the updates for the new role, I think it is good to always have a résumé ready to go." "...You have been totally awesome and I refer everyone and anyone that I know to you when they need a résumé that works!! You are the BEST! Thanks again!" "I can't thank you enough for the professional résumé! You did an outstanding job in such a short turn around. I felt like you really cared about me as a person. I will surely pass your services along to my friends." "The final draft looks great! It is thorough and looks very professional. I look forward to starting my search. Thank you for all your help and patience answering my many questions. I will certainly recommend your services." "I have gotten nothing but compliments on my background during interviews and I know that it is largely because of how you presented the information. I have had multiple offers." "Michelle, thank you for all your help! You packed a lot of information in two pages but the résumé is beautiful. I also appreciate your advice for the cover letter." "The group of executives I met with were very impresssed by my résumé and it really makes all the difference in the world when jobs are competitive. The way you laid my résumé out makes presentation easy as I feel like I am simply telling the story of my career to this point. Should I be selected for this job I will be reaching out to you sometime in the near future for another update of my résumé. I will also continue to pass along your information to my peers and colleagues who need résumé assistance." "This looks GREAT! I am so excited about this ... you have no idea !!! :) THANK YOU .... you rock!" "I just wanted to drop you a quick note to let you know I have been submitting my new résumé for 7 days now and have received calls for 5 interviews! One of them is for a company I had applied to previously and didn't receive an invitation for an interview, but when I sent the revised résumé, I got a call the same day. I cannot express my gratitude enough!" "Thank you Michelle ... you have done a top notch job ... your phrases and words really capture the direction!! Thanks again for your 5 star work. *****"
"Michelle, I just wanted to thank you for my amazing résumé. I got my dream job. Part of that is because of the awesome resume you created for me. Worth every penny!" "Thank you so much for all of your help. I got the job! You have been a life saver." "I am impressed! I am going to start using it today ... I had a very few changes ... Thank you for a stellar job!" Copyright © 1983-2018 Printed Pages. All rights reserved.